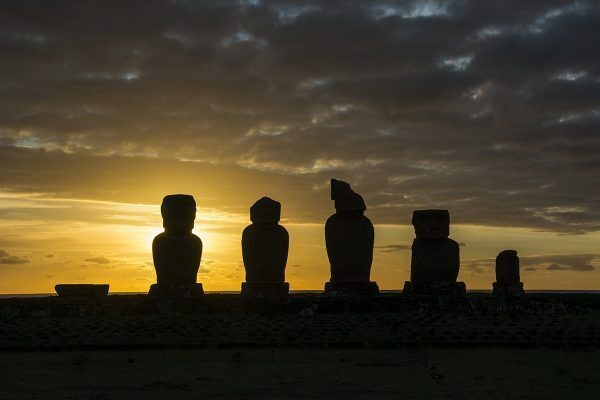 Often described as mysterious, enigmatic, and intriguing; Easter Island (Rapa Nui to its native Polynesian inhabitants) is a destination that allures visitors with its well-conserved native culture and the legacy left behind by its Rapa Nui civilization. 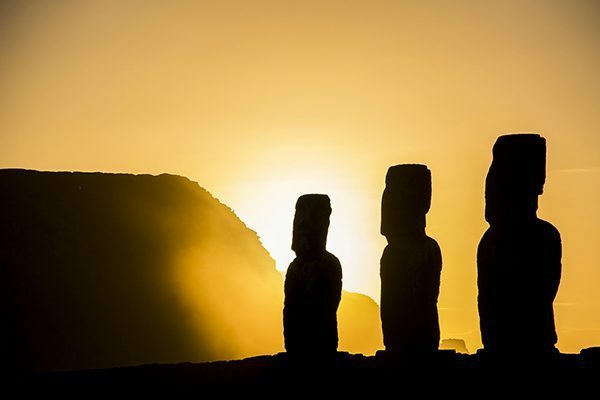 Its remote location in the middle of the Pacific Ocean has played an important part in the preservation of its compelling and unique culture that spans for over a thousand years – including its impressive moai statues. 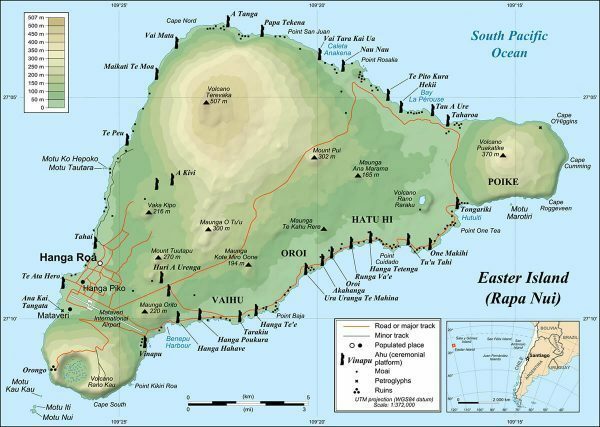 Just to put in context how remote Rapa Nui is, the nearest inhabited island is Pitcairn Island, 2,075km away, and the nearest continental point lies in Chile, 3,512km away. Now, visiting one of the remotest inhabited islands should not be as expensive as it sounds. In fact, I managed to travel Easter Island for almost a week for a lot cheaper than I expected, spending an average of $46.79 per day (not including the flight). 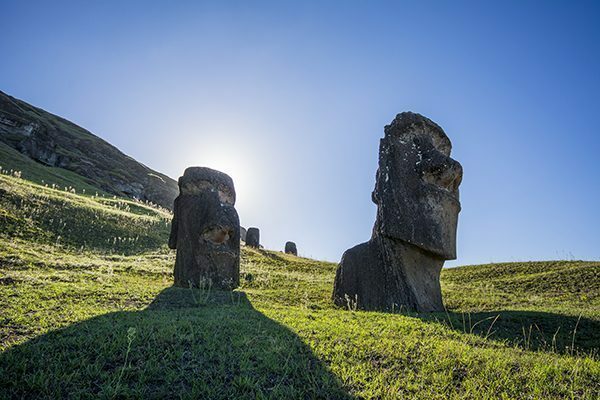 Here’s how you can enjoy the best of Easter Island for less than $50 per day and what you shouldn’t miss while there. Without a doubt, the flight to Easter Island will be the biggest expense of your trip. 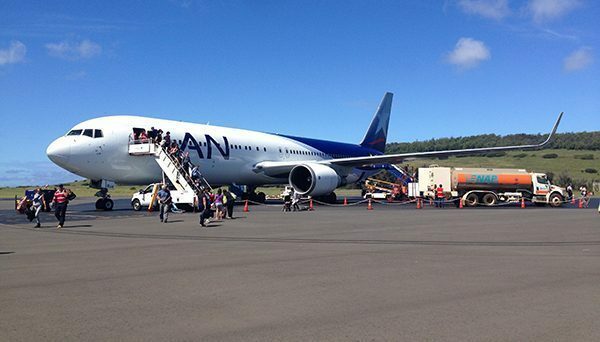 LAN Airlines is the only airline that flies to Easter Island. Since there’s no competition, expect to pay anything from $300 to $1,200 for a round trip flight. Your best bet to get it cheaper is to follow LAN Airlines newsletter for deals. They often give 15% to 20% (or more) off their domestic flights in Chile (yes, this is a domestic flight), or on specific routes. This was the way I found my flights for $505 to spend Easter Sunday on Easter Island! What better time to be there?! Well, as I found out, they don’t do anything special for Easter Sunday, so it’s just like any other day. LAN flies to Easter Island once a day, except for Tuesdays, and also does a stop over in the island on the way to Tahiti (once a week). For How Long Should You Stay? Even though the highlights of Easter Island can be done in one day if you rent a car or take a tour, I highly recommend staying there for 4 or 5 full days, at least. Why? 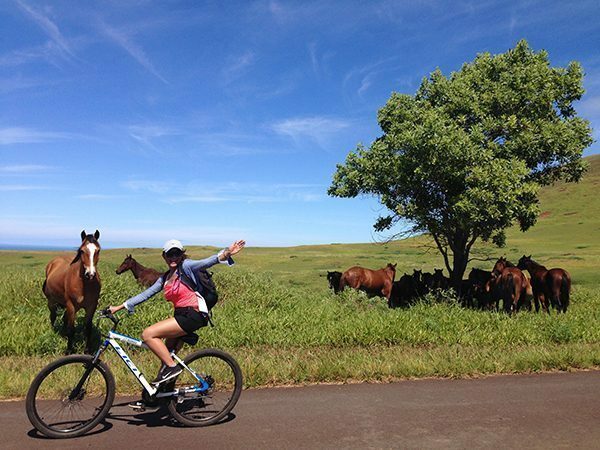 There is a lot to do and see on the island that goes beyond the moai statues. I’ll go more in depth below, but activities include caves, hiking, biking, diving, and more. Accommodation in Easter Island varies from budget to Luxury, but still, budget accommodation is priced slightly more expensive than the norm. Originally, my intention was to couchsurf in Hanga Roa (the “only” town in the island), and to my surprise, there are several hosts willing to host surfers. 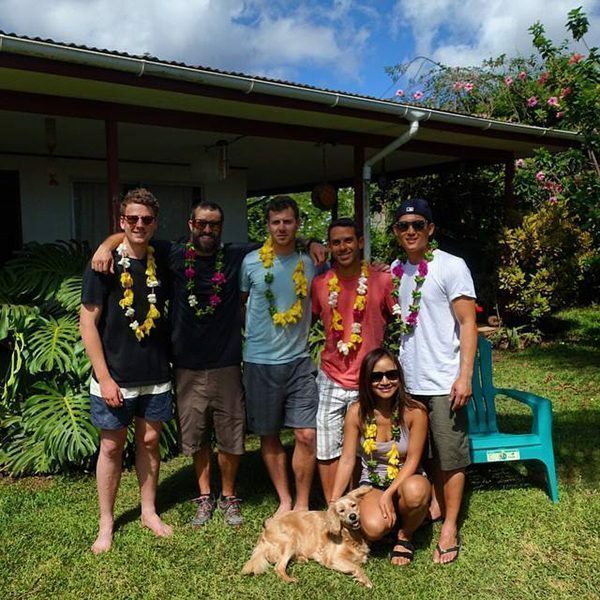 The reason I didn’t couchsurf was because I happened to meet 5 other travelers in Chile that were also traveling to Easter Island, so between all of us we decided to rent a house through Airbnb, and to be honest, this was the cheapest and best option for all of us. We ended paying $13.64 per night per person for a three bedroom house with two bathroom, kitchen, living room, a nice patio, and all the amenities we needed for the week. Plus, it was just 15 minutes walking to the main street. I seriously recommend using AirBnb to find cheap accommodation in Hanga Roa. You’ll find cheap options that might be better than staying in a hostel, especially if you’re traveling as a couple or as a group. From my research, AirBnb averaged $18 to $25 a night per person on most accommodation options. 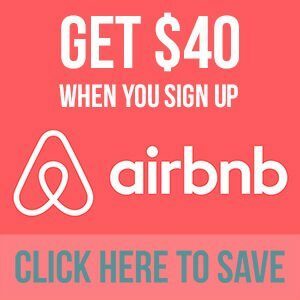 NOTE: If you don’t have an Airbnb account, through this link you will get $35 off your first reservation. The crew in front of our AirBnb rental. Since the airport is just in town, most accommodations offer airport pickup and drop off. There’s no need to coordinate your arrival time since there’s only one flight per day. Hanga Roa is small enough to walk, if you fancy it, but should you need a ride, you can take a taxi for about 2,000 CLP ($3.21) to most points in town. You also have the option of renting bikes, motorbikes, and cars to move around the island. If you rent a car, you might be able to see most of the highlights in one day! It takes only about 30 minutes or less to get from one corner of the island to the other. Through our AirBnb host, we rented a car that fit six people for 55,000 CLP (about $91) for a day, but should you want a smaller car you will be able to find it for 40,000 CLP ($66) at the car rental center on the main street and even as low as 20,000 CLP ($33) if you rent it through an accommodation host/hostel. For the lower price, you might need to barter a bit. Biking is very easy on the island since the terrain is mostly flat, and the hills are gentle. In fact, biking to the beach was one of my favorite experiences there (more on this soon). We rented bikes for 8,000 CLP ($13) each for a day. Should you decide to bike the island, instead of driving, you might need two days of sightseeing – one for the southern route, and one for the northern route (unless you’re a fast biker with a lot of stamina!). The most important part of eating cheap in Easter Island is being able to cook, so make sure you have a kitchen in your hostel/hotel/Airbnb rental/etc. It is essential you do your groceries in Santiago before flying to Easter Island. This includes all produce, meats, pastas, seasoning, etc. Between us six, we brought two boxes full of food to last the duration of our stay. This alone helped us save a lot of money since food in Easter Island is really expensive. NOTE: On your flight to Easter Island you’re allowed to check two bags for free. One of those bags should be your food box. 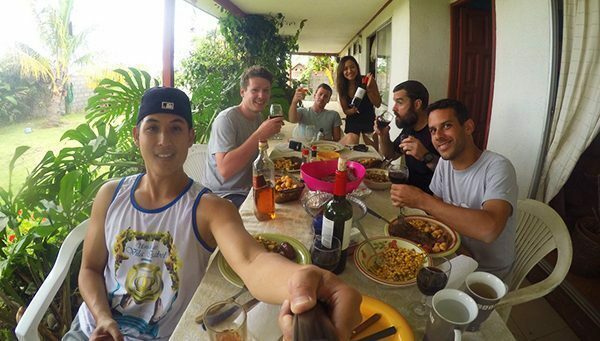 Our Easter Sunday Lunch… all brought from Santiago and cooked here with love! Should you need to buy a few extra things once in the island (like we did, there are several “panaderias” and local shops that sell all essentials (but at a higher price – like $2 for 6 eggs). Should you need to eat out, empanadas are the cheapest food you’ll find around, at about $5 for an empanada of decent size. I recommend heading to Carrito Popatiri close to the waterfront on Policarpo Toro Street. Also, panaderias are great options for cheap food and snacks, mostly in the form of empanadas, fried snacks, and pastries. 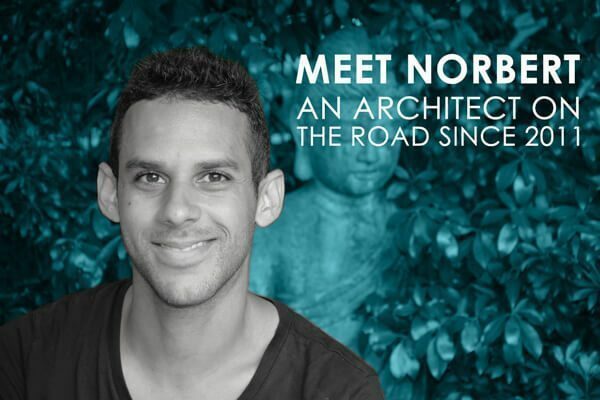 What You Shouldn’t Miss… Moai! 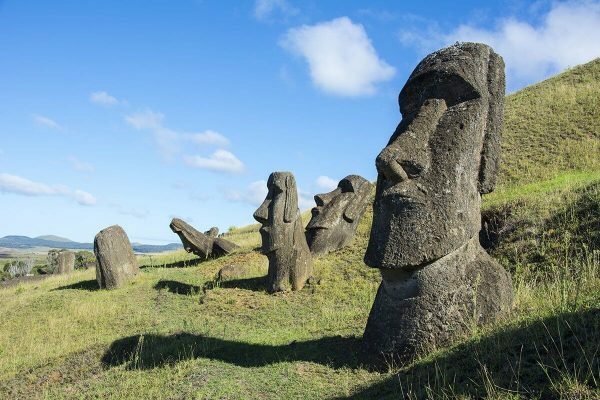 I’ll start with the obvious… the moai statues! There are statues all around the island, so you will see them everywhere you go. 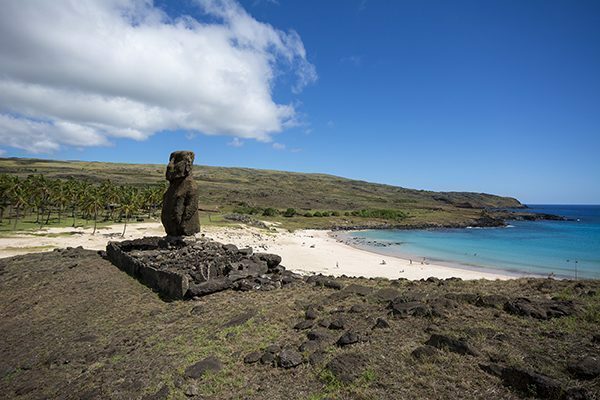 There are 887 moai statues found in all stages; from unfinished, to well-preserved, to mostly destroyed. The moai are monolithic human statues carved between 1,250 and 1500 AD. The moai are considered to be the “living faces” of deified ancestors. They look inland towards the clan that created them as a sign of protection. During their peak, the Rapa Nui population soared to 15,000 people, but, unfortunately, due to the deforestation created by their own cultural production – the moai – their civilization declined (due to famine) and their population reduced to 3,000 by the time it was rediscovered by the Dutch in 1722 – precisely on April 5th, Easter Sunday – hence the name. 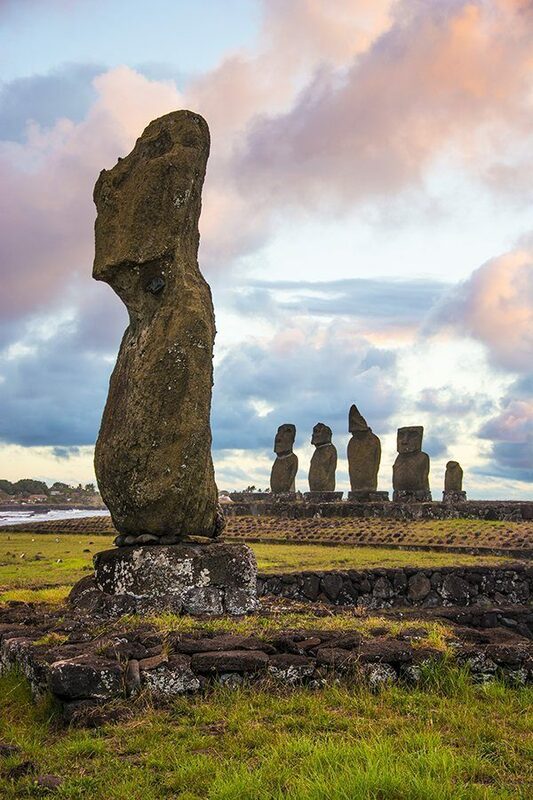 For years, the production and transportation of the moai was a mystery to archeologists, but the Rapa Nui ingenuity has been slowly revealed through studies and clues left behind by the ancient civilization all across Easter Island. For more information on Easter Island, I highly recommend reading this Wikipedia page. 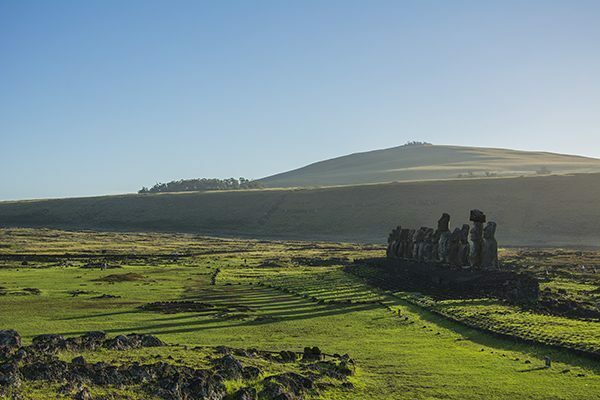 While you will see moai statues all around the island (mostly along the coastline), you must not miss visiting the Rano Raraku National Park. This was the main moai quarry and the place where you’ll see them in all their glory and in all stages of production. Here you’ll see all shapes, expressions, and even a form of sculptural evolution between the early and latest moais produced. In fact, about half of the moai of Easter Island are located in this national park. Also, if you have the chance, hike up to the crater to get an impressive view of most of the island. Rano Raraku is one of two national parks in the island (the other being Orongo National Park), so there’s a fee of $60 for both parks. Now, when I went there, Easter of 2015, there was an island-wide protest against the CONAF (Chilean National Parks Agency). Locals “kicked CONAF out” of the island and are now managing the parks. Locals are not asking for the payment of an entrance ticket, but they do ask you pay for a local guide in order to access the parks. Since this confusing situation was fresh for everyone, we didn’t know we needed a guide, so when we were asked about our guide we played dumb and were let through to see the parks – no tickets paid, no guide hired. We saw all the moai sites for free! Depending on when you go, you might need to either pay for a guide or pay for tickets, so Google the most current situation before you go. Should you need to hire a guide, I found out that some go as cheap as $10 per person for a day (not including car rental), and others go as expensive as $170 or a day (no matter how many people in the group). Another site not to miss is Tongariki. This is one of the most iconic sites in the island with its 15 moai standing next to each other on an Ahu (ceremonial platform). Watch the sunrise there, it is marvelous! Funny enough, in April, sunrise is around 8:30am, so no need to wake up too early! 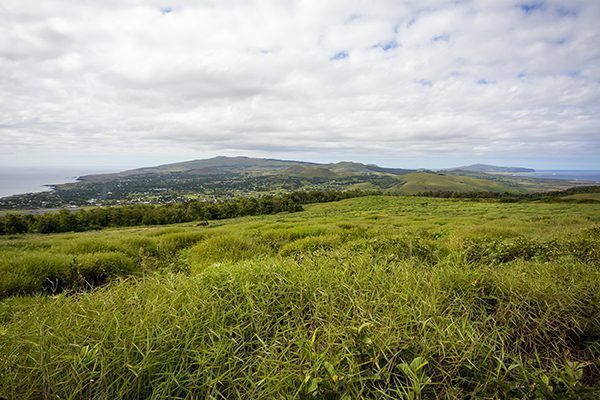 From Tongariki, you can jump straight into Rano Raraku, and from Rano Raraku you can drive up and back to Hanga Roa to see other moai sites like Taharoa, Anakena, A Kivi, and more. Seriously, you’ll be moai’d out by the end of the day. 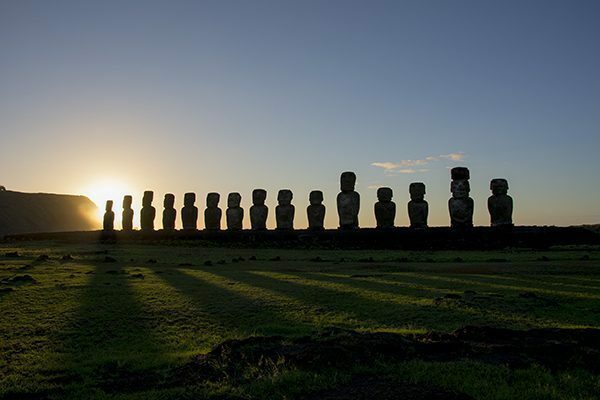 And, don’t miss watching the sunset in Tahai, where five moai stand on an Ahu right at the edge of the island. This site is right on Hanga Roa, so you can walk there easily. 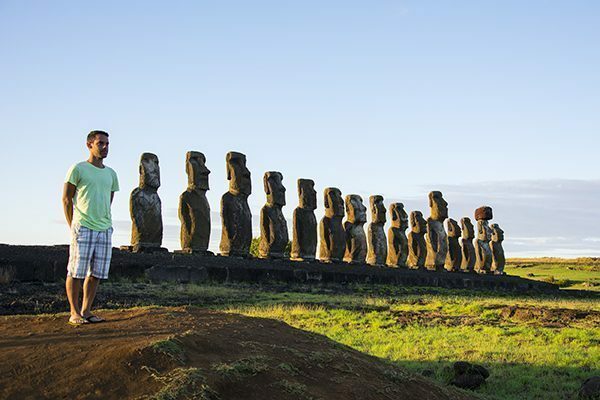 While the moais take all the attention, Easter Island has a lot more to offer. Anakena not only has moais, but it is also one of the best beaches in the island. According to oral tradition, Anakena served as the first settlement on the island. 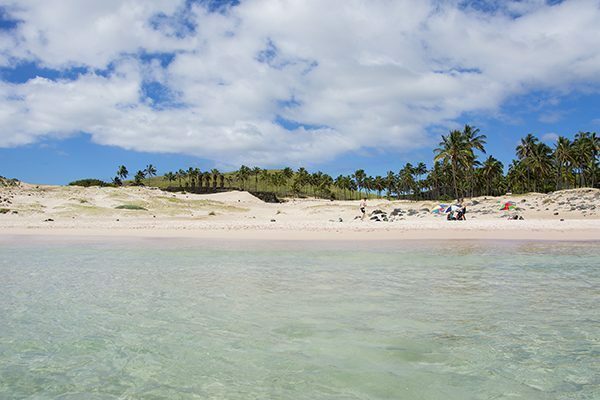 While I don’t consider Easter Island a beach destination, it is worth it to visit this beach and spend some time there. I went there twice, once by car and once biking, and I never saw more than 30 people on the beach. It is quite chill! If you bike there from Hanga Roa, it takes 1 hour and 45 minutes to get there (20 kilometers). 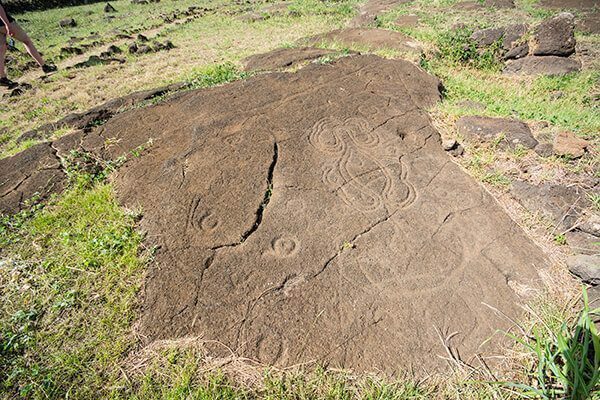 Also close to Anakena, there are a few sites with petroglyphs left by the early Rapa Nui civilizations. They depict several marine scenes that include fishing, the use of canoes, and several marine animals. Some of the best petroglyph sites are Orongo, Papa Vaka, and Ana Kai Tangata. You can also hike to the top of Volcano Terevaka (the highest point on the island at 507 meters above sea level… so cute!). From there you can see the entire island in a 360-degree view. What most people don’t know is that Easter Island has a decent network of caves, and some of them can be visited. Ask your host about a tour to the caves so they can take you. Some of them are really hard to find, so you must know where to look. Ana Kakenga is one cave from where you can watch the sunset since it has an opening looking towards the sea. Remember I mentioned there are two national parks in the island? 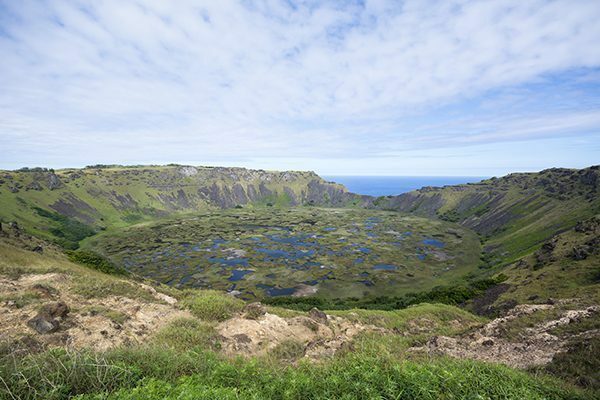 The second park is Orongo, and it is all about the natural uniqueness of the Ranu Kau volcanic caldera and the stone village and ceremonial center found at the edge of the caldera. 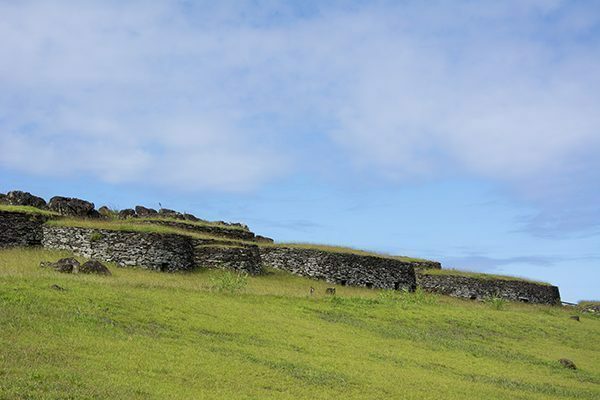 Here’s were some of the ancient Rapa Nui lived, in a collection of low, sod-covered, windowless, round-walled buildings. Even the doors are very low and small to reduce the amount of wind (and cold) that entered the dwelling space. The view of Easter Island from Orongo. Also from Orongo you can get a great view of Hanga Roa and most of the island. You’ll see how beautiful it is! Should you be interested in seeing a traditional Rapa Nui (or other Polynesian culture) dancing show, you can head to Vaitemiki in Hanga Roa. They offer free shows on Mondays, Thursdays, and Saturday. (at the time of writing). There are other shows that include dinner (for an entrance fee), but you should ask around for current locations and times. For divers, even though I didn’t dive, I found out that diving there is not that expensive at around $120 for two dives. I can’t say how good or bad they are. If you want to see marine turtles, walk along the water towards Orongo or simply sit at the restaurant next to Pea Beach (right in front of the football/soccer field in Hanga Roa) and you’ll probably see a turtle or two swimming there. Sure you can, but unless you want an in-depth explanation of each location, you won’t need it. You can tour the island for “free” by researching each site beforehand and by biking or driving to each location on your own. Should you still want a tour, I don’t recommend booking any tours before arriving. You can find them easily in town and a lot cheaper. Get an Easter Island stamp in your passport at the post office in Hanga Roa. Buy souvenirs at the artisanal market in Hanga Roa. Not the cheapest ones, but cheaper than at the airport and national parks. Wifi… don’t count on it. Luckily my AirBnb rental had decent wifi, but not a single other restaurant or place we visited on the island had working wifi. Follow LAN for their latest deals or keep an eye on their fares. Couchsurf or rent a room/house with Airbnb. You can camp too. Buy all your food in Santiago and fly it in. Eat at carritos and panaderias, should you need to. If you’re traveling with more people, rent a car for a day. Should you be alone, rent a bike for two days. Try to go without a guide, or get a cheap guide if required. (Depending on the protest situation). Don’t do a tour… go on your own and inform yourself with guides and the internet. This guidebook comes highly recommended. As you can see, Easter Island is not an exclusive destination for intrepid travelers and big pockets. It is much more accessible than you think, and all you need to know is how to do it on a budget. And now you know! Great tips! Thanks for the heads up about buying food in Santiago before flying in; I had no idea food on Easter Island was so expensive. Now that I know it’s possible to visit Easter Island so cheaply, I may need to plan a trip! Jessica, you certainly should! I think it is worth visiting, especially if you can do it cheap! I love finding the budget travel posts because in reality everyone still has to follow a budget and doing an attraction like this on a budget is great to add to my inventory .. thanks for the great post. It’s really fun reading your adventures. Easter Island is in my bucket list as well as Pantanal in Brazil (which I am feeling is where you are now!). Just curious if you have been to Madagascar–any thoughts, advise. Thanks. Im going by myself and I was a bit afraid but you encourage me. You’re welcome, Amber! I’m sure you’ll enjoy it! Great post, thanks for the info! Is hiking around the island doable as well ? Thanks! Well, it depends on how comfortable you are hiking long distances, but I think you can hike it partially. The terrain is pretty smooth, overall, so it shouldn’t be a though hike. The thing is that I don’t know of any place where you could stay, outside of Hanga Roa, unless you camp, which I believe might be possible. We’re flying in from Tahiti, rather than Santiago. Do you know if the same rules apply in regards to bringing a bag of food in? Travel easter Island keep observing in their adventure blog and so most important topic . The whole post is awesome, But you know what? I’ve been researching my upcoming Easter Island trip (over Easter 2017!) for almost a year, and I have to say , yours is probably the most useful site I’ve read… It answered most of my questions – whether I should book a tour or not, whether I should book it beforehand or after arriving there, whether I could cycle around town (I don’t drive! ), which are the absolute must-do things etc. I’ve also just had a quick look at the rest of your site, and I’m probably going to spend a lot of time in the future reading about your adventures! Hi, Sid! Thank you so much. If you have any question, don’t hesitate to ask! This is so helpful! I literally just booked my plane ticket to Easter Island 10 min ago. It was an impromptu decision at 2am 😀 So excited! You’re going to have an awesome time there!